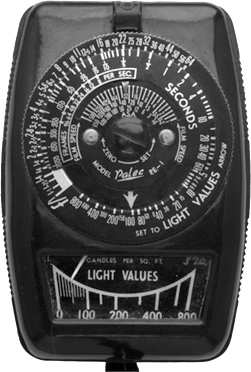 My first Australian meter; I didn't know they made any. This is from Paton Electrical Pty of Sydney, Ozzieland. At first glance, it looks like a rip-off of a DeJur Dual Pro. The general look and layout are very similar, even down to the flip-down gate on the end which serves as a high-low light level baffle. But—there are important differences. First off, this is probably the heaviest meter for its size that I own, even including my S.E.I. 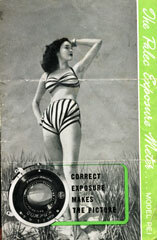 Photometer. It's as if the innards were made of lead. The next is that the flip-down baffle on the end also actuates a little push-switch, which controls the high-low light ranges. When the gate is closed, the meter range is 0-800 candles/square-foot. When the gate is open, the button pushes out and the scale physically changes to read 0-80 candles/square-foot. So you don't have to multiply by 10, or note whether the baffle is up or down, or make allowances on the calculator dial. It's done automatically, and that's nice. The only other meters I've seen with that feature are Weston Masters. The bad part about this is that the calculator dial is crowded and somewhat hard to read. It's not bad in bright light, but indoors it can be a chore. The killer is the ASA section, which goes from 1 to 650 and I seriously needed a magnifying glass to read it. Setting the light values was easy, and reading the aperture/shutter combinations was managable, but they have it calibrated in 1/3rd stop increments and that makes it very, very crowded. The dial really needs to be about double its size. Obviously I'm not the only one. The PE-2 is virtually indentical, except that it's off-white- instead of black, and the calculator dial is simplified and a lot easier to read (albiet in BSI, not in ASA, but there's a conversion table on the back).